Dreamweaver: Ah! Meng – Yi Lu Ping An Lah! Ah! Meng – Yi Lu Ping An Lah! Ah Meng...she was presumably the most famous orang-utan in the world, a worthy representative of Singapore, an icon of her time, irreplaceable and priceless. And she died of old age on the 8th of Feb this year. Ironically Chinese all over the world were celebrating the beginning of the Chinese New Year, the much awaited year of the rat, that day. I didn't know her personally, but I did have the good fortune to visit her twice, once with my grandparents and the second time with my parents. Images of her are still vividly clear in my head. Stoic and dignified, like any grand matriarch should be, she used to sit there sometimes in her enclosure and outside in the mornings, when some fortunate visitors, tourists and Singaporeans alike, were allowed to have breakfast with her and her grandchildren. As is the case with animals of all sizes and shapes, she had the ability to elicit in her human visitors, awe, excitement, enthusiasm, and curiosity, about such prominent ape human similarities. Ah Meng's life history goes back many years, 48 to be precise, when she was smuggled from Indonesia into the island city and kept as an illegal pet for many years, until she was rescued by a local veterinarian. She was eleven years old then and being one of the critically endangered Sumatran orangs, she was housed at the Singapore Zoo. Thus she made the Zoo her home in 1971, and since then has been the head of a fast growing clan. She had two sons - Hsing Hsing and Satria, and three daughters, Medan, Hong Bao, and Sayang, as well as six grandchildren. Her rise to fame was apparent when she became the poster girl of the Singapore Zoo. Pictures of her have been used in Singapore's tourism advertisements worldwide. She has also been featured in over 30 travel films and more than 300 articles. Some of the foreign dignitaries and celebrities that visited Ah Meng included Prince Philip and Michael Jackson. The Zoo' Breakfast with the Orang-utans primely featuring Ah Meng, was very well received. The Zoo greatly increased public awareness about the endangered species through this interactive programme. Apart from the obvious fame, Ah Meng's life has been dotted with interesting events, some of them not so fortunate. In August 1978, a visitor to the Zoo threw a sharp metal object at her, causing a gash on her cheek. In March 1982, during the shooting of a promotional video at Mac Ritchie Reservoir, Ah Meng climbed a tree and stayed there for three nights. On her way down, she fell seven storeys and broke her right arm. Some stories about her life have been hilarious though, and portray the innate human side of the girl. 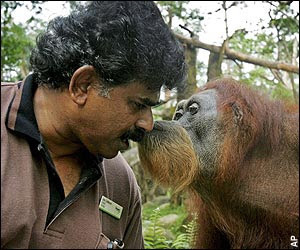 In March 1992, Ah Meng became jealous that her long-time keeper, Alagappasamy Chellaiyah (in the photograph kissing ah meng), paid attention to a female research student studying orang-utan behaviour. The orang unhesitatingly attacked the girl. As she aged, her public appearances became less frequent for fear of subjecting her to stress. And then she died suddenly, leaving the whole of Singapore and much of the world in shock. A memorial service was held for Ah Meng on the 10th of February in front of 4000 visitors. A fitting tribute indeed to someone who influenced so many lives personally and aided the fiery cause of conservation of her kind. A bronze statue of the same size as Ah Meng was also unveiled. Just goes to show how important she was to everybody, and what a mark she left behind, considering that the normal procedure for any other animal death in the zoo, would be an autopsy and a bio secure bag! As a tribute to her, the next orang-utan to be born at the Singapore Zoo will be named Ah Meng Junior. A durian tree will be planted at her grave because durian was her favourite fruit. Even though you have flown away on silver wings to a land of abandon, you will be fondly remembered Ah Meng. You were a phenomenon, a bright ray of hope in a morally and ethically declining world. You showed us that one doesn't have to be a human to be human. It's all within, in a special place called the heart. You were much loved, respected and adored and we bid you farewell. Gong Xi Fa Cai dear friend, and we pray that you have an eternity of freedom, forests, and lots of bananas in your new home. Zai Jian!! !